single row diamond grinding cup wheel-Changsha 3 Better Ultra-hard Materials CO.,Ltd. Feature ideal tool parts for beveling, smoothing and sharping, excellent performance. 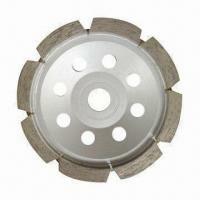 Single row grinding wheel is ideal for beveling, smoothing and sharping, excellent performance.